As his countries most distinguished furniture designer Bruno Mathsson gained an international reputation for Swedish design and his work over a 50 year period will remain a significant contribution to Sweden’s design history. That he stood at the leading edge of furniture design is reflected in that many of his designs, innovations in their day are now widely acclaimed as timeless modern classics. Bruno Mathsson was born a cabinet maker. His father, Karl Mathsson, was a master cabinet maker of the fourth generation and it was therefore obvious that the son would follow in his fathers footsteps. The son learnt his trade from the bottom up and thus acquired a detailed knowledge of wood technology and thorough feeling for the qualities of wood . However. For the young Bruno this was not enough. Fascinated by the possibilitis he found in developing the form and function of furniture by using new tecnology he was inspired by the functionalist movement. By the 1920s and 1930s he had become deeply absorbed in his own studies borrowing literature on design from the curator at the Röhsska Konstslöjdsmuseet (Röhsska Arts and Craft Museum) in Gothenburg, Axel Munthe. Self taught he was to grow into one of the most celebrated interpreters of the functionalistic school of ideas. In 1931 Bruno Mathsson carried out his first practical experiment in functionalism, the chair ¨Gräshoppan¨ (The Grashopper), inspired by a scholarship granted by Värnamo Hantverks- och Industriförening (Värnamo Craftsmen- and industrial association) and a visit to the birth place of functionalism in Sweden, the Stockholm Fair in 1930. At Värnamo Hospital, who bought the chair for the reception area, people found it so ugly that it was put away in the attic. One item only has been preserved at the Bruno Mathsson show room in Värnamo. Now Bruno Mathsson had got his appetite whetted and enthusiastically he continued the experiment with the so called bent-wood technique. He created work chairs and reclining chairs in this technique and, at the age of 29, he had his first one-man show in 1936 at the Röhsska Arts and Craft Museum in Gothenburg. The walk along the road to success had started. Bruno Mathsson had his international breakthrough as a furniture designer at the World Fair in Paris 1937. His furniture excited great enthusiasm and admiration and were in great demand all over the world. He was represented at the Museum of Modern Art in New York when it opened in 1939 and at the fair in San Fransisco the same year. When the great upholder of culture in Sweden, Gotthard Johansson, had visited the Museum of Modern Art and seen Bruno Mathsson´s show there, he wrote enthusiastically in the Svenska Dagbladet on May 11th 1941¨For the first time in my life I felt a secret pride in being born only twenty kilometers from Värnamo¨. That was an acknowledgement that meant much to Bruno Mathsson´s self confidence and development as a designer. Sweden of course meant much to Bruno Mathsson. He chose to stay on and carry on his work in his native town Värnamo. There he had his roots. There he could live in peace and develop his art. In reality, however, Bruno was a great internationalist. Early he made contact with people in designer circles all over the world. In the 1940s he made a long journey to the USA together with his wife Karin, where he met with pioneers in architecture and design like Charles Eames, Walter Gropius, Hans Knoll and Frank Lloyd-Wright. The journey was of great importance and gave, among other things, as a result the famous Mathsson glass house design. During the winter he lived in Portugal in one of his own glass houses. He loved Denmark in general and Copenhagen in particular. One if the evident proofs to posterity if the danish contacts is the Super-ellipse table he created in co-operation with Piet Hein. During the 1970s Bruno Mathsson developed valuable contacts in Japan, where there is still a significant licenced production and sales of hios designs. For a world artist like Bruno Mathsson it was essential – for his design language as well as for the promotion of his work – to play on well-chosen and well-tuned instruments. A well-composed exhibition was one of these instruments. Bruno Mathsson participatedin furniture exhibitions all over the world from the Form Design Center in Malmö, Sweden to the Museum of Modern Art in New York. Since 1964 on Bruno Mathsson´s furniture has been represented at a permanent show room at the Bella Center in Copenhagen. After his death several memorial exhibitions have been held, among others in 1991 at Hörle Mansion outside Värnamo and in 1993 both at the National Museum of Art in Stockholm and at the furniture fair in Milan. Bruno Mathsson was a striking artist, wilful, stubborn and clever (in a typical way for his native county) and with a certain feeling for the simple, fastidious beauty and elegance in form. In all his work he managed to combine the beauty of form with well-thought-out function in a way that is but rarely surpassed. This is to be found not only in his beautiful, functional furniture but also in his glass houses which are market with exactly that – the simple, the beautiful and the functional. The light and the lightness combined with an ingeniosly well-thought-out heating system and well-insulated triple glazing make the peculiar nature of his glass house. Bruno Mathsson was in this way a pioneer. It is, however, the furniture that has given Bruno Mathsson the reputation as one of the greatest designers in the world ever. In the technique of bending laminated wood he found a seating line that is unsurpassed in fastidious elegance and ergonomic function. The furniture he created have nearly all become classic. He gave each model a female name, Eva, Mina,Miranda and Pernilla etc. It gave each a sort of identity of its own. When, in the 1960s, Bruno turned to tubular steel is his furniture design, he did it with the same mastership he had shown in wood. What makes Bruno Mathsson´s furniture unique is that – although to a great extent designed in the 1930s to 1940s and are seen as “classic” – they still feel eternely young. They are loved and bought as modern, functional furniture by young people and not just as collectors items for connoisseurs. International sales are as high as ever and his designs find new audiences being exhibited at museums worldwide. Like his designs, Bruno Mathsson seemed eternally young. He lived with and for his art and never seemed to get weary in his eagerness to create new furniture for a new age. At the age of 80 he followed the development in working with computers and created a line of computer furniture wich has the necessary qualities to become classic design of the future..
Bruno Mathsson was conferred with honours all over the world and was, of course, flattered by and proud of the attention. But there was one event he appreciated more than anything else. When he returned to the Museum of Modern Art in New York in the 1970s for a show, the distinguished newspaper, the New York Times, had put a head line all over the front page -¨Bruno is back¨. He had become Bruno with the American people. More than 55 years after his international break through, Bruno Mathsson posthumously attracts national and international interest. The cultural legacy he left behind is not only a swedish matter. It concerns us all. A little tense for the meeting with the famous furniture designer I had arrived in good time outside his parent´s home, which also served as a cabinet maker´s workshop and office, at Tånnögatan in Värnamo. I was expecting to meet a serious and disciplined architect. Exactly on time a fiery red open top Rover arrived, driven by Bruno Mathsson wearing casual sports wear crowned with an elegant leather pilots helmet. It was magnificent entry, worthy of a master of the functionalist language. This is how late manager Henry Thelander related the story about his first meeting with Professor Bruno Mathsson which was to lead to a life-long friendship and working partnership. Henry Thelander became Bruno Mathssons grey eminence and they worked side by side for more than 40 years. Henry Thelander´s sons, Bo and Dan, now carry forward this cultural tradition in the company Bruno Mathsson International AB. Bruno Mathsson was born to cabinet making. 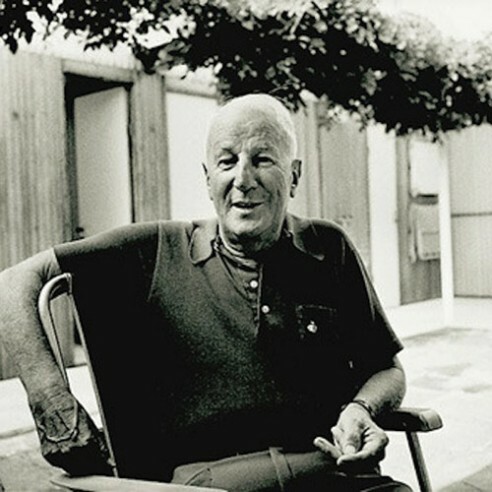 His father, Karl Mathsson was the fifth generation of master cabinate makers in the family and it was natural that Bruno should follow in his father Karl’s footsteps. From an early age he acquired a solid technical knowledge, learnt the necessary skills for craftsmanship and a well developed feeling for the charecteristics of wood. For Bruno Mathsson this was not enough and from a young age he was fascinated by the challenge of designing fuctional furniture combined with high technical quality. The ideas of the functionalist movement captured his imagination and he educated himself through detailed study during the 1920s and 1930s . In 1929 came the opportunity to borrow books and magazines from Röhsska Arts and Crafts Museum in Gothenburg becoming aquainted with its curator Gustaf Munthe a contact which was to be mean a lot throughout Bruno Mathsson’s career. Soon big boxes filled with books were sent by train between Värnamo and Gothenburg. In 1930, Värnamo hosted an Arts and Crafts exhibition where the Karl Mathsson workshop showed a traditional baroque-style chair worked on by Bruno Mathsson. The chair won him a scholarship and with it the opportunity to visit the exhibition in Stockholm which saw the launch of the Swedish functionalist movement. This exhibition had a major influence Bruno Mathsson. Even from a critical viewpoint he gained through the exhibition a significant insight that something new was developing. This recognition combined with his intense studies of the material borrowed from Röhsska Arts and Crafts Museum released him from the traditional thinking of his fathers workshop to find his own design language. In 1930, the opportunity arose to put his theorys into practice when he was commissioned to design a new chair for Värnamo Hospital. Bruno Mathsson’s idea of designing a comfortable chair without traditional sprung upholstery led to an unusual solution. The chair, nick named Grasshopper by the hospital staff, was made with a seat frame covered with plaited webbing supported by arms and legs in solid birch. The controversial chairs were put away by the hospital staff to remain hidden until after Bruno Mathsson’s breakthrough. However. Bruno Mathsson was fired with enthusiasm and energetically continued to develop his ideas. He carefully studied the “mechanics of sitting”. For example, to find the perfect seating curve he tried, among other things, sitting in a snow-drift in order to study the imprint his body had made. He began to experiment with the techniques of bent laminating wood which gave him the opportunity to achieve great strength in gracefully executed minimalist details. Between 1933 and 1936, this work resulted in, among other things a series of the three basic chairs which came to be called working, easy and loungechair model 36. These chairs were designed using a one piece frame covered with plaited webbing supported by separate bent laminated legs. Early in 1936, Gustaf Munthe, curator at Röhsska Arts and Crafts Museum in Gothenburg, gave Bruno Mathsson the opportunity to do have a one man exhibition at the museum. The exhibition was opened on March 14, 1936 and gave Bruno Mathsson the chance to show his ideas to a bigger audience. Among the exhibits were his new series of chairs and an ingenious folding table. The exhibition was a great success leading to the breakthrough and recognition of Bruno Mathsson as a leading designer in Sweden. By 1937, a year after the exhibition at Röhsska Arts and Craft Museum, he was represented at the world exhibition Paris Expo, winning a Grand Prix for his bed Paris. During Paris Expo, his furniture was appreciated and admired by an international audience becoming in demand all over the world. This included the manager for the design department of Museum of Modern Art in New York, Edgar Kaufmann jr; who two years later in 1939 ordered chairs for a new extension of the museum. That same year his furniture was represented, among other places, at the world exhibition in New York and at the Golden Gate-exhibition in San Francisco. The leading commentator in the field of culture at the swedish crafts association, Gotthard Johansson, visited the Museum of Modern Art and experienced Bruno Mathsson’s furniture. In May 1940, he wrote enthusiastically a long article in the leading swedish newspaper Svenska Dagbladet: “One single modern swedish furniture-artist holds an exceptional position. His name soon to be internationally known is Bruno Mathsson from Värnamo. He is without doubt one the most individual figures in the swedish arts industry.” “.. when I this summer found the furniture in the worlds most exclusive exhibition hall, I felt for the first time in my life a secret pride of being born only 20 km from Värnamo”. This was an acknowledgement that would come to mean a lot for Bruno Mathsson. Between 1948 – 49 with his wife Karin Bruno Mathsson paid a longer visit to the USA. During their travels the couple were introduced, through Edgar Kaufmann jr., to the most influential architects of the continent. These contacts inspired Bruno Mathsson to create his famous glass houses using a concrete plate laid directly on ground equipped with electrical floor heating. The first example was his own exhibition hall in Värnamo, which was ready in 1950. One wall was made of brick the other three of Bruno Mathsson’s own patented design. “Brunopane”, consisted of a triple glazed window with the air gaps filled with insulating nitrogen. Close to nature the house reflected Bruno Mathssons love of function and light and the building raised enormous interest. The following decade a significant number of houses were produced using Mathsson principals. However, when building permission was sought it often met with bureaucratic resistance. Different local authority officials questioned the pioneering design and Bruno Mathsson grow tired of the intransigence he met and in 1960 he ceased building houses and not further construction took place. Karin and Bruno Mathsson, who were living in a rented wing to Toftaholms Manor-Hotel, built there own first house in 1960 at Frösakull on the swedish west coast. A summer house design where the borderline between the inside and outside almost ceast to exist. In 1964-65 a permanent villa was built by the shore of lake Vidöstern south of Värnamo and in 1973 a house in Vilamoura, Portugal, where the couple spent many winters. During the 1960´s, Bruno Mathsson returned to creating furniture resulting in a long line of furniture in both wood and steel. Together with the danish poet and mathematician Piet Hein, he developed the Superellipse- table and the Spanleg. In 1969 Bruno Mathssons furniture was first shown in Japan and in September 1974 Karin and Bruno Mathsson made their first visit to that country. On the initiative of the Japanese, a exhibition was opened in the Swedish Centre Building in Tokyo. In 1976 Bruno Mathsson developed a furniture collection adapted for the Japanese market and licensed manufacturing began. Today both Japanese and Swedish produced furniture are sold successfully in Japan. “They wanted to know about the ´Mathsson method´, not so easy to explain even for the best of translators. Finally, Bruno Mathsson asked for a big peace of paper, placed it on the floor, asked a listener to lie down on his side on the paper and drew with his pen a more or less elegant contour along the Japanese back from the shoulders to the feet. The pedagogical trick arouse charecteristically moderate Japanese enthusiasm and revealed drastic differences between traditionally eastern sitting on the floor and western sitting in chairs”. Back from his travels, the indefatigable Bruno Mathsson continued designing. He had won recognition over the world and when he returned with an exhibition to Museum of Modern Art in New York in 1978, the New York Times wrote in a headline “Bruno is back”. He also got a number of distinctions among which can be mentioned Gregor Paulssons-statyette (1955), Prince Eugens gold medal (1965), Knight of the Royal Swedish Order of the Wasa (1967), member of The Royal Society of Art, London (1978) and assigned professors name by the swedish government (1981). Bruno Mathsson was a striking artist, self-willed and stubborn. He lived with and for his art and never appeared to grow tired in his eagerness to create new furniture for a new time. In 1981, at 74 years of age, he created a workstation for computer users. The workstation is equipped with a so called “wing” that supports the users shoulders. In 1986, the last piece of furniture left Bruno Mathssons drawing-table, the easychair Minister. Suffering from illness, Bruno Mathsson died in 1988 leaving behind a rich cultural heritage. His designs remain contempory, they are looked upon both as art and as utility goods while simultaneously being displayed in museums. They modern, fresh and functional to each new generation.